This dish isn’t complicated at all. It’s healthy and delicious! You’ll have perfection in 45 minutes. Preheat oven at 175οC. Season fish with salt and pepper inside out. Whizz garlic, bread and parsley in your multi and divide in their cavities. Drizzle with olive oil, sprinkle with oregano and thyme. Wrap in 4 seperate pieces of baking parchment, place on a non-stick baking dish and bake for 35 minutes or so, depending on the size of the fish. In the meantime prepare chards. In a large non-stick frying pan heat oil on medium heat and cook all ingredients, adding 1/2 cup of hot water. Season with salt and pepper and cook for a few minutes until all liquid has evaporated. 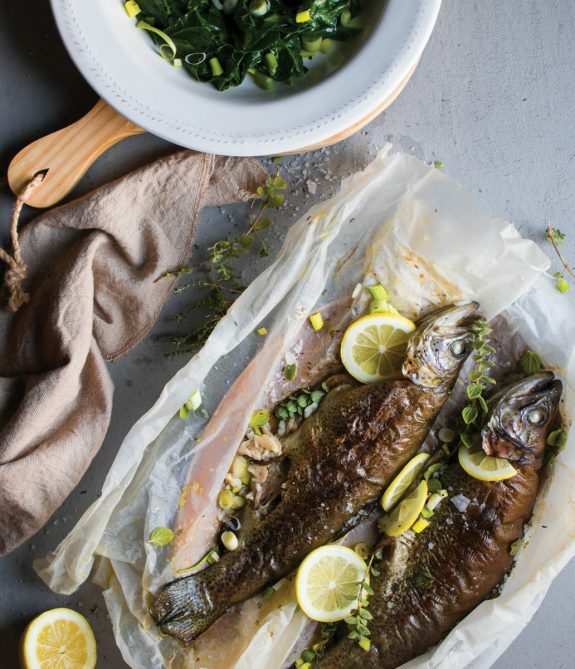 Serve trouts sprinkled with spring onion and lemon along with warm chards drizzled with lemon juice and oil.